Before I tell you my story with another fabulous oldie Tina now 76 here is a few paragraphs about my journey from Superstars to the other superstars of life like lonley Bob in Waitrose. I have been fortunate to photograph some of the worlds biggest stars however today my true love is saying hello to and celebrating and photographing our wonderful older generation. After so 25 years travelling the world and these photographing stars I felt it would be nice to give everyday people some celebrity treatment. 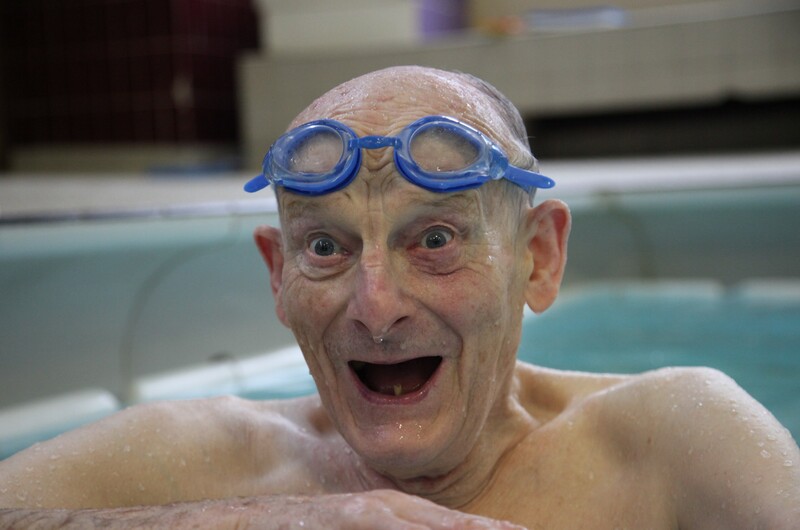 So in 2006 I began to photograph older people in my local swimming pool and making them laugh with my camera however it was the incredible stories I heard about their lives that really touched a part of me that no celebrity story can touch. So I began ”sayinghello there” everyday to a stranger especially older people, as I found them to be so much fun and they just made my heart glow as if my soul was being filled with sunshine. People often ask me where did the name Fabulous oldies come from. In truth after a few weeks of photographing older people in my local swimming pool I had so many pictures of our oldies laughing I had to name a folder on my computer and because I had met so many wonderful older people I called the folder ”Fabulous Oldies” which has recently become this blog celebrating our older generation. So in my case I sometimes find it awkward to say I am a photographer, simply because people so often say oh ‘do you do weddings?’ As soon as I mention the superstars I have photographed, people light up with almost a glazed look. Yes I have had some very glamorous times and have some amazing stories to tell however the superstars I have worked with are still just people like you and me. They are ordinary but with a desire to be great at something and have become extraordinary but no more extraordinary than millions of older people around the world who have done extraordinary things in their lives plus the many who still out daily raising thousands for charites. Its for this reason why I began this picture blog to celebrate our wonderful oldies everywhere who are the other superstars our media rarely celebrate until their obituary? When you meet big stars and get behind the showbiz mask you are reminded they still fill the kettle at the tap, squeeze tea bags and often dip biscuits in their tea and do all the ordinary things we do daily. He was so normal; it was as if I had known him for years, we just sat there with mugs of tea and all Michael wanted to know about was my life, and where I bought my shoes; this acting genius was being himself and I guess as we get older we all soften up and are more comfortable with who we are. Its funny Michael ,Elton John and Barbara Striesand are now all pensioners and were so pleasant when I photographed them. I celebrity photography has become so predictable, every magazine around the world featured beautifully posed pictures, gorgeous portraits of stars at home in a kitchen or by their pool. These pictures appear so manufactured with artists looking so perfect; and I wondered who were these people behind the carefully manicured image. Back in the 1940’s, 50’s and 60’s stars were photographed in a more candid way, in actual real life situations and I wondered I if I could photograph a superstar in this more relaxed style for a whole day. So I thought who is a truly incredible woman that the world really admires so asked some fabulous oldies i knew in their 80s and several said Tina Turner . So my personal challenge was set would it be possible to photograph Tina Turner in a different way to how she had been photographed for the past 40 years. I had been reading a book about achieving your dreams and it said if you really want to do something you just have to ASK yes just ASK. Two weeks later I was at the British pop awards and saw her manager Roger Davis and I approached him nervously and suggested the idea to photograph Tina in a way never done before from dawn to dusk, like A day in her life in black and white I said let me be a fy on the wall and capturing the human side of this superstar and he appeared to like this idea. I could not believe two days later at 7am I was in a hotel suite in London having breakfast with Tina, she was in her dressing gown, and were going to Paris for the day on her jet! I had never met Tina and here I was eating croissants in her room and like Michael Caine she was very ordinary but obviously extraordinary. I guess it is a confidence in who you are – you don’t have to put on an act – she was just herself, so natural. Within 5 minutes of meeting her I began taking pictures, it was really quite surreal. I then shot a few pictures of her packing her case. It was 8am and Tina’s driver was late so when we arrived at the private jet terminal we all had to run for the plane. It’s funny, there was no passport control just more coffee and croissants, then we were on Tina’s plane. On the plane, I was telling Tina a few jokes, she was laughing and then she fell asleep. It was a strange feeling being next to her asleep but it made a rather beautiful picture. Within 50 minutes we landed in Paris and again no passport control, we ran from the plane to a Mercedes and then zoomed into Paris with the French paparazzi racing next to us trying to shoot Tina through the car window. We arrived at the Ritz Hotel and Tina ran from the car as her security pushed away photographers I was surpised how she could run so fast. At the hotel, Tina had her make up done and around 25 pairs of shoes delivered and then she put some tracks on from her new album. I asked her to dance and spin around as if on a catwalk, the light was really low so these pictures have a little blur, however, I do love these photographs. Around 2 pm Tina suggested we go for a walk, or a Tina wander as she put it, meaning clothes shopping like all girls! I was so impressed as Tina was chatting to so many older people as if they were her old friends she was just so ordinary and thats why she is such a star, because she treats people with such respect and she was so kind. After a a few hours shopping Tina suggested we get something to eat. I was thinking of a posh restaurant however, Tina wanted some ordinary food that you just can’t get in top hotels. She went into a patisserie, bought some french sticks and goat’s cheese and we went to a park to sit and relax. It was all a bit surreal but as i said most stars are just like us, they do actually do all the ordinary things like us. Tina Turner buying frech bread in Paris, France. Later in the afternoon we went to visit a recording studio as Tina was recording a track for her new album and wow Tina’s voice was just mesmerizing. I felt so privileged to be in her company, it is when you are this close to a superstar that you realise they are one of those people that have practiced all their life to become extraordinary. Tina had a special aura, her presence, charisma and the 40 years of practice had made her become this iconic star. Tina was so happy so I asked her to pose for some candid portaits but not look at the camera and I tried to make her laugh and she just came alive and these were probably the best pictures of the day. Later around 10 pm we were flying back to London and Tina took us for a Chinese and I was asked if I would like to come to a few concerts over the next few days. A few days later Tina was performing where she lit up the crowd with a thundering performance, what a star! I was amazed at her energy and even now at 76 I am sure she could set the stage alight what an incredible lady she is just like all our older generation all over the world.